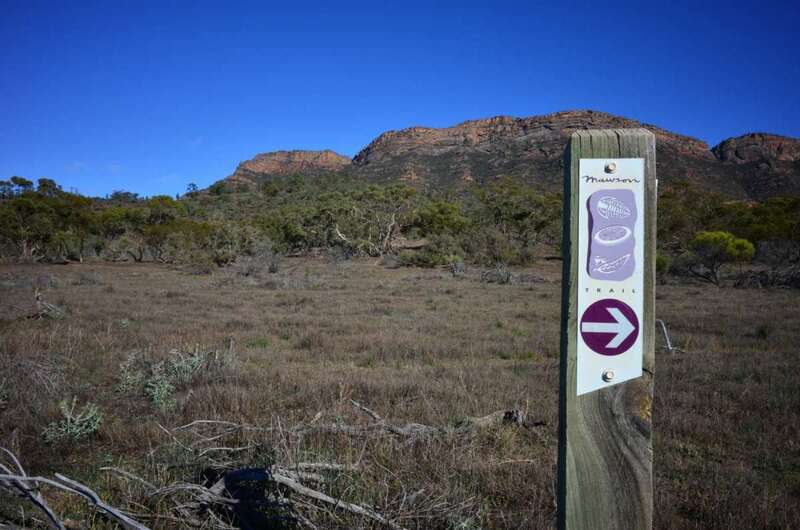 The Trails SA maps refer to the Mawson as an “off road” trail. I can’t see how they work that out – it’s almost all on roads of some kind. They are mostly secondary dirt and made gravel roads, unmade vehicle tracks with a few sections of singletrack, and some excursions across private land. Some sections are bitumen. As you’ll see looking at the map it is not a direct route – rather it has been designed to follow interesting, scenic and low-traffic roads instead of the highway. Because of this there is usually the option of a shortcut on the bitumen if things get dicey. Some of the roads can become impassable if it rains heavily; take care and be cautious, particularly in the northern sections, which are very isolated. There are trail markers along the way, and they are surprisingly good and complete. You can expect one at each intersection, and a few along the way just for reassurance. Even so, you can’t navigate by them alone; you still need a map. I think the best way to view them is as a check; if you have not seen a marker for a while, then chances are you’ve lost the trail – particularly if you get to an intersection and you can’t see a marker. That’s when it’s time to pull out the map or GPS and check your position. As you travel along the trail for a few days you’ll get inside the system a bit to know when to expect them, and if you haven’t seen one for a while when to get nervous. Printed maps of the Mawson are available from BikeSA. There are 9 maps, and the total cost is $AUD76. The current edition was printed in 2012. Personally, with my old man eyes, even stopping to put reading glasses on I can’t get much from these maps. I’m an electronics guy, but even so I can see the benefit of printed maps. I asked BikeSA if PDFs were available for download, and was told no, as they don’t own the copyright. Fair enough. I’m sure the route itself can’t be copyright, so I’ve included a .gpx file for download here. (I had to make it a .zip file though, because of the WordPress security settings – you’ll just need to unzip it) And I’ve made a Google Map route. I’ve checked my .gpx against the official map and I’ve ridden it, so I’m happy to stand by it. I take no responsibility and make no guarantees though. Make of this what you will; speaking with cyclists there are many opinions on the best way to navigate – using a GPS, printing out your own maps, reading PDFs on your tablet; I’ll leave that to you. Events sometimes conspire to force the closure of parts of the trail. Most recently it was bushfires. There is no guarantee that the trail will be open all the way so be prepared. As I’ve also mentioned some sections might unridable due to mud. TrailsSA may have information about closures on their website. Bon chance, mon ami. Below are Google Maps and Ride with GPS versions. Same file, just a couple of options to suit different preferences.